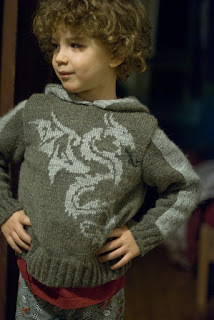 Dragonfly Designs: The Luckiest Little Boy. Ever. The Luckiest Little Boy. Ever. I found the pattern for this sweater. There is a website that has all the old Bergere de France patterns uploaded into PDFs on it. I have no idea if it is "safe" or "legal" and honestly, since the site is completely in French, I have no way of knowing. However, when I translate the page (thanks Google Chrome) it comes up as a Bergere de France website, so hopefully no copyright laws are being broken. The best thing is that all the patterns are FREE. Yep, completely free. The pattern is also completely in French. Go figure - my residual 8th grade French doesn't extend that far. We never learned knitting terms, and the only thing I remember how to say is that I don't speak French. However, I had another stroke of luck: there is a translation website here. Now, for the hard part: translation. It shouldn't be that bad, as lots of knitting patterns are written with repetition. I am hoping that translating it won't be terrible, or take 50 hours. I don't think it will, as once I get into a rhythm, we should be good. The weather is proving to be helpful in prepping things for my Etsy shop this weekend. We are threatened/promised (it depends on how you look at it) with ice and snow. For most northern states, that's not a big deal, But here in the south, it's HUGE! It is rumored that we can have between 4-8 inches of the white powdery stuff, with a 1/4 inch of ice. Around here, especially in the foothills of the Appalachian mountains, that's very dangerous. The street that we live on has a steep hill, and getting up (or down) that hill safely is going to be a trick if it's icy. Since we're going to be cuddled up anyway, no time like the present to get things situated! I will probably roll things out as I have them, rather than wait and put everything out all at once. If I waited, it would never get done! So, please watch for more updates, and I'll post when it's ready! Please leave a comment or feedback on the Etsy site (constructive or positive only, please) and let me know what you think!